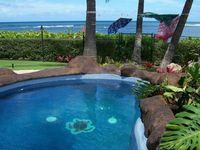 Ka'ena, which means "red hot" or "glowing" in the Hawaiian language, is the name of the northwestern tip of the island of Oahu. 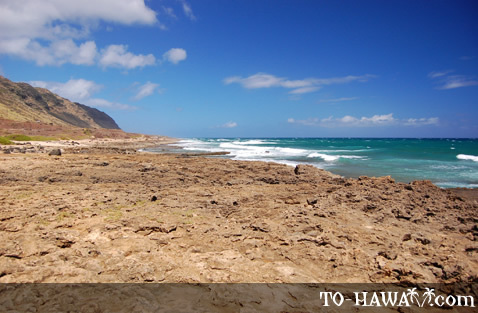 Ka'ena Point State Park (view panorama) is so remote that no road leads here. 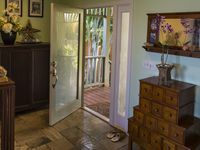 Access is only possible by hiking here, either from the road that ends north of Makaha on the west shore, or from the road that ends behind the Dillingham Airfield on the north shore. 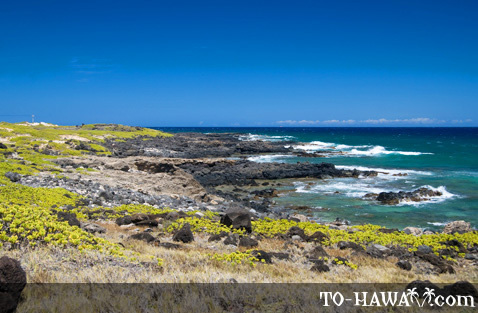 The 853-acre (3.45 sq. km) park stretches for 9 miles (14.5 km) around the northwestern tip and is home to numerous seabirds, including albatrosses and rare native plants. 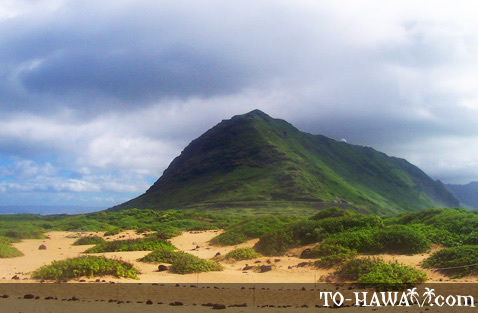 The whole area is steeped in legend, such as stories of Pohaku o Kauai and Ka Leina a ka Uhane. Pohaku o Kauai, meaning "rock of Kauai," is a rock in the ocean just off Ka'ena Point that was named after the demigod Maui tried to join Oahu and the neighbor island of Kauai. 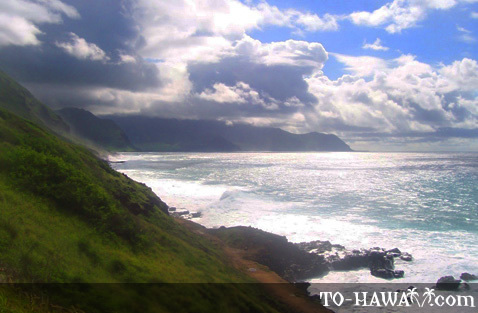 He took his magic hook "mana i ka lani," meaning "divine power of heaven," and threw it across the Ka'ie'ie Waho Channel to snag Kauai. After tugging on the tagline he could only loosen a large boulder. 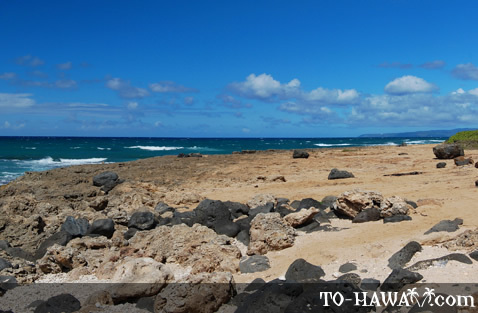 The rock fell into the ocean at Ka'ena Point where it remains up until today as Pohaku o Kauai. 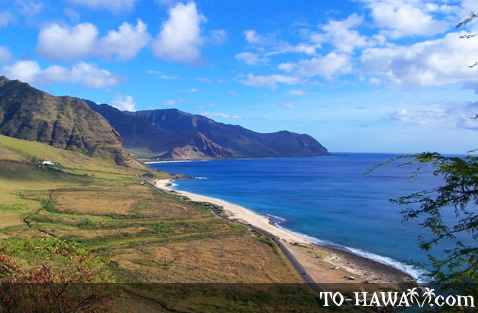 According to Hawaiian folklore, Ka'ena Point was also known as the place where souls depart from the earth, as a "jumping off" place, a "leina a ka uhane." 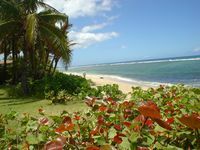 After a person died, the soul would find its way to a leina a ka uhane, such as the one at Ka'ena Point. 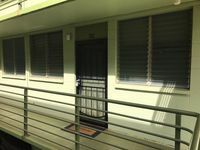 The exact point was called "ka leina a ka uhane," meaning "the leap of the soul." It is also known as White Rock because of a large limestone formation on the north side of the point. 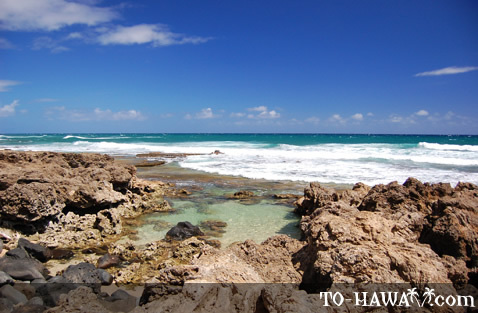 Ka'ena Point has a rocky shore and is backed by sand dunes. The best thing to do here is fishing and hiking. Stay out of the water because dangerous rip currents and very large waves are often times present. There are also a lot of rocks in the water. So swimming, snorkeling or other water activities are not recommended and there are no lifeguards. 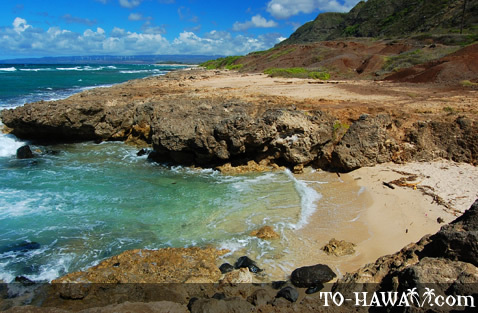 Ka'ena Point State Park includes the nearby Makua Beach and Yokohama Bay (also known as Keawa'ula Beach). These are the only sand beaches where swimming is possible when the ocean is calm. 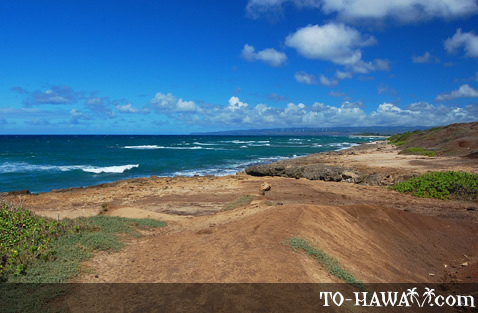 If you plan to hike to Ka'ena Point from the leeward (west) coast, you can drive all the way to Yokohama Beach, up to where the road ends, park there and walk north. 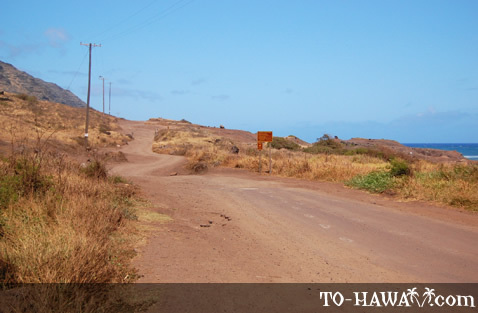 There is a narrow trail that will lead you to Ka'ena Point. Take a water bottle with you because the area is often times hot and dry (there is no shade). It will take you about 1 to 1.5 hours one-way. Keep in mind that the albatrosses there are protected by law, so don't try to go close to them or to find their nest. 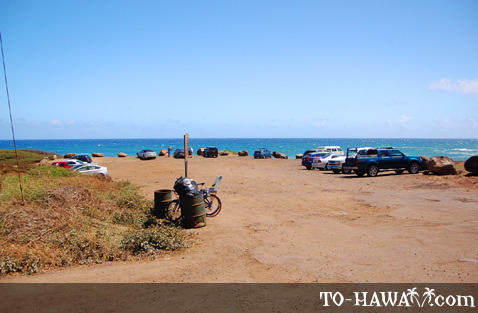 On the way to Ka'ena Point (on the trail that leads there from Yokohama Beach), you may come across some dumped or abandoned junk cars that have been thrown over the cliffs or parked on the side of the trail. Sometimes just the motor parts or tires are left – a not so pretty sight in paradise and very unfortunate that this happens. 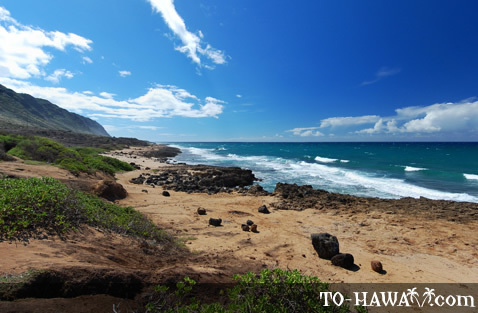 Alternatively, you may also hike to Ka'ena Point from the trail that begins at the end of Farrington Highway on the north shore, just past Dillingham Airfield and Camp Erdman Beach. Rate this beach a 5+, beautiful white sand. The hike is not hard but lots of big rocks so you must watch each step you take. Going back tomorrow! This place is awesome. Some decent swells. Just dont go on the weekend. There are alot of people that dont care about anything but food and drink.